Centara CEO Thirayuth Chirathivat presents a Centara The 1 Card to Panadda Wongphoodee, Miss Thailand 2000, the first brand ambassador of Centara The 1 Card. CENTARA HOTELS & RESORTS today launched its first loyalty program, choosing St. Valentine’s Day to promote its new rewards card and theme – Loyalty from the Heart. The heart of the new program is its new free Centara – The 1 Card. The card will enable members to accrue points that members can use for a free stay at any Centara hotel or resort, anywhere in Thailand or overseas – without any blackout dates. 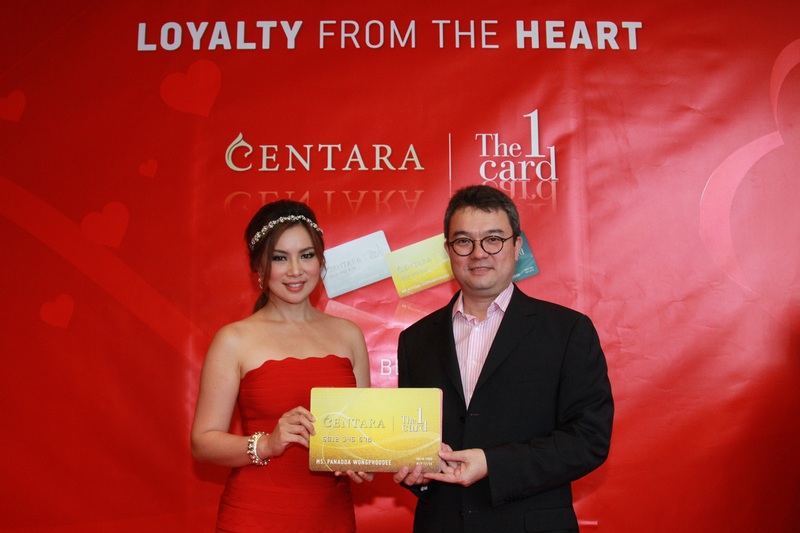 “St Valentine’s Day is, we feel, the perfect time for us to launch Centara –The 1 Card,” said Thirayuth Chirathivat, CEO of Centara Hotels & Resorts. There are four tiers to membership — Classic, the entry level; Silver; Gold; and Platinum Elite. Members progress upwards through the tiers simply by earning more points. At each level the rewards increase, with free room upgrades, early check-in and late checkout, pre-registration, guaranteed room availability, and much more. Mr Thirayuth said that members of the program would find it very easy to earn points that go towards a free hotel stay. “They will earn five points for every 30 baht they spend when staying with Centara Hotels & Resorts, dining in a Centara restaurant, or relaxing in a Centara spa. And if they book directly through the Centara website and they will earn double these points. “Members will also earn points when dining in a Centara restaurant or enjoying a Centara spa, even if they are not actually staying in a Centara property and will also earn points when they shop at any Central Retail Corporation store. Membership in Centara – The 1 Card is free. It is also fully compatible with The 1 Card, the very successful loyalty program that is operated by Central Retail Corporation Ltd.
Chris Bailey, senior vice president for sales and marketing at Centara Hotels & Resorts, said that the company feels the basic premise of membership will itself be a powerful marketing tool. Centara – The 1 Card will be promoted in a variety of ways, via advertising campaigns, online and social media marketing, database marketing, and point-of-sale. “We shall also be marketing through Central Retail’s The 1 Card, and we see that as being an exceptionally strong marketing tool, as there are in excess of 4 million members of The 1 Card in Thailand, and the number is continually growing,” said Mr Bailey. Members of Central Retail’s The 1 Card will also be able to redeem their existing points for free hotel stays by taking membership of Centara – The 1 Card.